Seid Ahmed Kemal is a Legume pathology researcher at the International Center for Agricultural Research in the Dry Areas (ICARDA). This is one of a series of portraits of key people in Africa RISING. 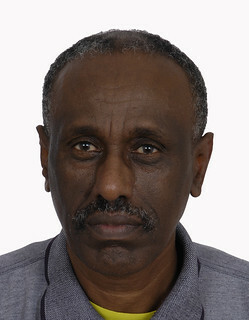 Seid was born in Ethiopia and did his BSc in Agriculture and MSc in Crop Protection at Haramaya University. He has a PhD in Biology from the University of Saskatchewan. 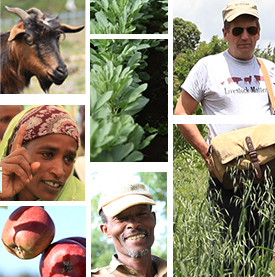 At ICARDA, he is a member of legume breeding team that develops high yielding and disease resistant food legumes. He also researches the epidemiology of food legume diseases and supervises graduate students. What is unique about Africa RISING? He considers Africa RISING as unique because it is implementing on the ground with farmers; involves many stakeholders and also because it brings CGIAR centers to work together in action sites. In his work, he hopes that preferred barley and faba bean cultivars are adopted in the mono-cropped wheat belt of the Ethiopia highlands, reducing the threat of wheat rust and enhancing the roles of legumes in sustainable production of cereal crops. What do you think are the most challenging part working in Africa RISING? While working with Africa RISING he thinks the most challenging elements have been to move from system characterization results to select interventions. He also observed looser inter-CGIAR linkages, particularly in the first two seasons when the project started implementation. To address these, he said, developing joint activities (action research and scaling) with other CGIAR centers for instance CIP, ICARDA and CIMMYT is helping a lot. This is because it is difficult to benefit from what other centers are working to develop fertilizer rates; crop modeling etc. His involvement in Africa RISING has given him good lessons including how working with project staff, farmers, stakeholders and policy makers at lower levels can bring quick changes in technology adoption. What are the lessons you have learned so far? From his participation in the project he observed that malt barley and potato in some locations can bring a big change in the incomes of farmers (diversification) and should be linked with markets. In addition he said some CGIAR centers should come up with new interventions not developmental works like distributing seedlings, doing too many characterizations, etc. Tags: africa rising, portrait, rising, RISING voices, USAID. Bookmark the permalink. Previous post ← Just how much gender capacity exists in Africa RISING?